Review: Carey Mulligan Lights A Fire In 'Wildlife' Paul Dano movingly adapts Richard Ford's 1990 novel about a couple (Jake Gyllenhaal and Carey Mulligan) whose marriage crumbles as their son (Ed Oxenbould) watches. 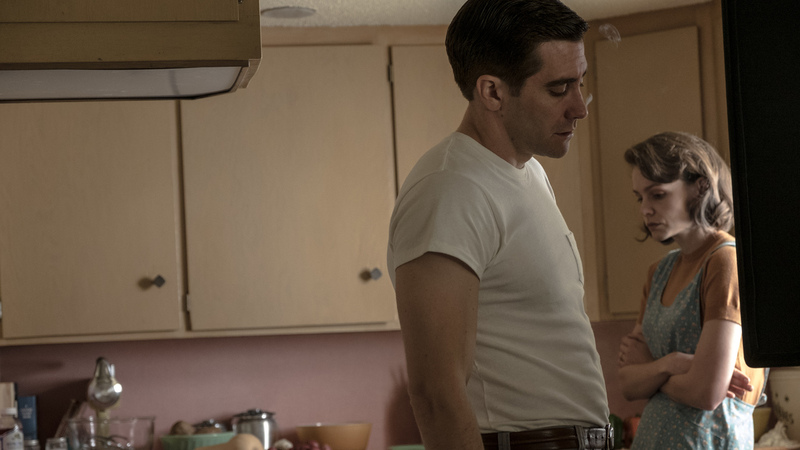 Jake Gyllenhaal and Carey Mulligan in Wildlife (IFC Films). We are living in an age where wildfires have become such a destructive physical force that they've lost some of their potency as metaphors. It's tough to watch thousands of actual homes be destroyed in California while thinking instead of the symbolic burning inside ourselves. Wildlife, an intimate new family drama set in 1960 and based on a 1990 novel by Richard Ford, feels like a relic in the sense that it deals with domestic upheaval behind picket fences, and could have been made a half-century ago by Douglas Sirk. But it's also a relic from a time when we could keep such environmental destruction safely at bay with human drama – the fires in the movie retreat harmlessly with the first snowfall. No matter, the fires are just backdrop anyway.They're here to accentuate this impressive debut film by Paul Dano, the latest in a new crop of actors-turned-directors that also includes Bradley Cooper and Jonah Hill, but Dano's acutely honed sense of style ensures this is more than a mere vanity project. Wildlife is both stately and messy, in the way mid-century America so often seems to look through the rearview mirror. The lawns are well-manicured and the canned beans are only 20 cents, but the existential grime is impossible to scrub off. The film boasts a sharp script by Dano and partner Zoe Kazan, hitting every beat without needing to pound home the big moments. And, of course, it helps to have Carey Mulligan on your team: Instead of merely giving us another bored period housewife, the actress turns her attention-starved young mother into something much darker and thornier. As the story opens, the Brinson family has recently moved to Montana so the father, Jerry (Jake Gyllenhaal, very good at being a petulant man-child), can take a job teaching golf at a country club. When Jerry gets laid off and Jeanette (Mulligan) gets a job instead, the patriarch signs up to fight the state's seasonal wildfires in a last-ditch effort to preserve the embers of manhood he's been desperately fanning since his glory days as a young athlete. "I've got this hum inside my head, and I need to do something about it," he tells his son Joe (Ed Oxenbould) on the day he leaves, hopping onto a flatbed alongside a bunch of drifters in thick boots, leaving his family behind. With her husband gone and little else to do, Jeanette also sets out to rekindle her youth, digging out some sensual pre-maternity dresses and regaling Joe with tales of her past flirtations. "I'm 34," she tells Joe when he asks her age, shattering the common childhood myth that all moms are the same age, and imploring her son to see her as a companion, maybe even a peer. This, of course, creates its own roadmap of psychological terrors for Joe. "What do you think about that?" Jeanette often asks him, as she proposes an activity that will almost certainly prove traumatic, including dining with a wealthy gentleman (Bill Camp) who clearly has the hots for her. Among Mulligan's many talents as an actor is her skill with line delivery: In Wildlife, she has a way of addressing her child that seems to look right past the fact of his existence. She makes her character's newfound confidence unsettling because you're never really sure which way she's going to turn next: "You have to like me the way I am," she mutters at Joe without looking at him, as a kind of fait accompli, shortly before she begins pushing him to places no teenager should have to go with their mom. It's maybe not surprising that Dano, whose best roles are misfits and weirdos, is very good at conjuring the sense of unease and distrust that surrounds his gawky young protagonist, since you could easily picture Joe growing into a Dano-type character. Oxenbould even shares some of Dano's facial features: the prominent forehead; the dramatically contoured cheeks. He has a good face for the camera to focus on for long periods of time, even though in point of fact he has little agency in the story, and is mostly there as a silent observer – a field guide to broken homes. But it's not just performance. The film also manages some interesting visual flair. Joe takes a part-time job at a portrait studio, allowing Dano to show us images of townspeople with their fake smiles for the camera, preserving their ideal selves. It would have been nice to see more done with the Montanan landscape, which rarely makes us aware of its presence (much of the film was shot in Oklahoma). Yet it doesn't detract from the quiet dread we feel as we watch this all-American family sprint into a towering blaze of their own making.